My daughter's pediatrician is a very fashionable lady and, sometimes, when we go to the hospital and I'm wearing nice shoes, she compliments me and ends up giving us free vitamins, Cetaphil, or even a discount on the month's immunization. 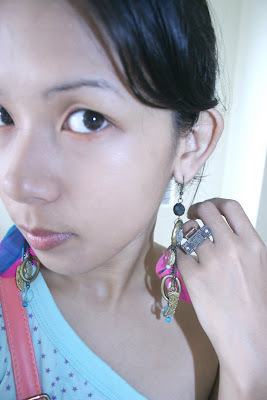 I figured my star bag from Manica would be the key item to wowing her that day, but she fell in love with my feather earrings instead. Free vitamins. Woohoo! And oh, can you believe I got those flats for only 200 pesos? There's a huge warehouse sale in SM Sucat in Building 2 where everything is super cheap. I also got little minion figurines from Despicable Me there (Syrena's favorite movie) for 50 pesos and a Harry Potter Gryffindor robe for her for only 100 pesos. Awesome, huh?